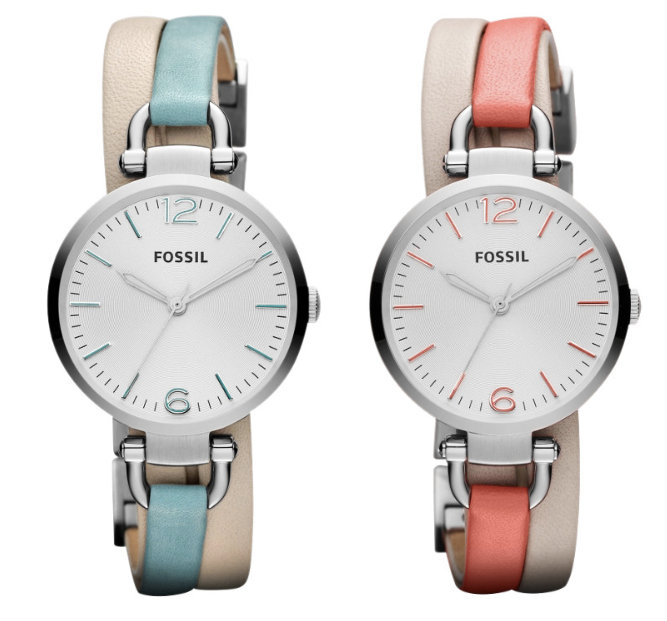 What It Is: A series of beautiful new leather-banded watches from Fossil, combining a stainless steel clock and a pop of colour in the form of a secondary band and matching face accents. The Adjust-O-Matic system makes it easy to find the perfect size right off the hop, and the elegant style makes it super versatile for ladies of any age. A total win for Spring! Who It’s For: Your mom, as a timeless Mother’s Day option. Your wife, as a gorgeous birthday gift. Your sister, as a special wedding gift to remember the ‘time’ she got married. I haven’t owned a watch for years. I would definitely consider this an option. This is one ‘fossil’ that should never be buried! A girl can never have enough watches. Pretty casual option for the day, like the aqua bracelet. I love these. Might be a nice graduation gift for my daughter. I love the big faces and the adjustable size. Love the pastel colours, very stylish! Fossel, what pretty watches,so femine,would love to have one on my wrist.and one that i can actually see the time.thanks! Love Fossil. maybe it’s ‘time’ for a new one. This is a neat style watch…I haven’t worn a watch in forever!